Do you have a freebie, but it only brings in a trickle of new subscribers? Maybe you’ve had the same opt-in since 2013. Do you even have a freebie? Wait, don’t answer that. You KNOW you really should have a killer opt-in for your readers. It’s the best way to deliver special content to them and make them loyal subscribers to your brand. That being said, too many of us ignore our opt-ins. We make a simple checklist or cheat sheet, slap it up in our sidebar, and call it day. No, no, no! If you really want to grow your influence and readership, you must make delivering valuable content a priority… always. I’ve been guilty of this too! So know that you are not alone. But I’ve learned the hard way that the old way of gaining subscribers just isn’t good enough anymore. You have to serve your audience’s needs, create gold for them, have a sparkly landing page, promote it like you mean it, and always keep it fresh. In the past couple of years, I’ve gone from a trickle of new subscribers with a sucky opt-in to a steady stream of new subscribers with an opt-in that rocks. In the past two days alone, my most recent opt-in is converting at an average of 70%. My last opt in converts at 95%. Really! 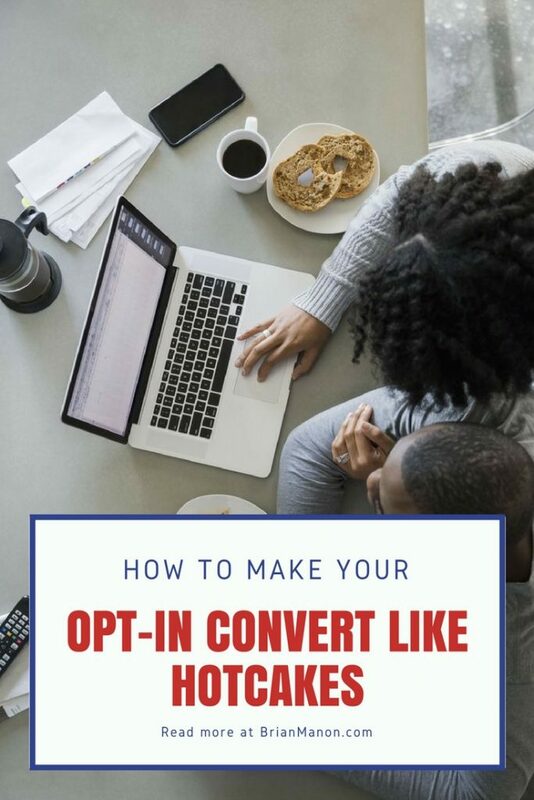 This is how to make your opt-in convert like hotcakes too. First and foremost you want to figure out what your people need and then help them with that. I’ve found the best ways to do this are to survey, poll, and listen. You can create a simple survey in Survey Monkey and send it to your list and even post it in some relevant Facebook groups. Ask probing questions to really nail down what your readers need from you. Just ask! Polling in groups is super easy and fun. If you have your own group you can poll there. You can also poll in groups that you belong to as long as it’s in keeping with the group rules. It’s very easy for people to click a prewritten answer in the poll and you are likely to get many responses. Lastly, listen to your people! What are they complaining about? What are they struggling with? What excites them? You need to pay attention to the conversations they are having on social media and in the comments section of your blog. What questions keep coming up for them? This info is gold for your opt-in creation. This is your moment, my friend. This is where you get to show new people what you are all about, what you have to offer, and how you can help them. Make it meaty. And by meaty, I don’t necessarily mean long. I mean make it full of substance. Cut out the fluff and give the people what they want! It could be a one page strategy sheet that gets them to their goal or it could be a 12-page report of some kind. Doesn’t matter, as long as it’s your best work. Make it something people would pay money for. Stop thinking of this as a FREE opt-in. When you think of it this way, you are subconsciously minimizing its importance. Think of it as the important piece of the puzzle that it is. Make sure that it has great formatting and branding. If your audience wants pretty, make it pretty too. Whatever you do, please don’t just answer a question or give a quick win, which is what I hear gurus saying all the time to do. That way of doing it just doesn’t work. Maybe it once did, but it doesn’t fly anymore. Every blogger and their grandmother are putting out freebies, so go in depth with your answer or strategy to make it stand out. It will be better received and will be easier to market because it’s so valuable. Okay, so now you need a really good landing page to promote your offer. There are some differing opinions on this, but I’m a fan of a short opt-in form. My highest converting landing pages have been short and sweet, with a minimum of information, and the opt-in form. It needs to look good. Use a great landing page plug in to ensure that your pages look pro. I prefer and use Thrive for all my pages. Now that you have your opt-in and landing page done, you need to promote it. Promote it everywhere and like your life depends on it. JK. But seriously, it’s pretty important to the growth and success of your email list and business. So go promote, and then promote some more. You can promote it in relevant Facebook groups (with the admin’s permission, of course). You can pin it to the top of your Facebook page and the top of your Twitter profile. You can create a beautiful pin for it and pin it on Pinterest. Don’t forget to include a link for your opt-in in all your social media bios, too. 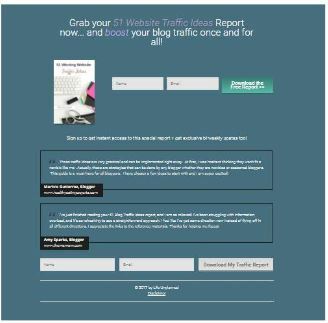 You can write a post about it, and you can guest post and link to your freebie in your bio. You may not have looked at your opt-in in a while. You set it and then you forgot about it! (Guilty). Always be catering to your audience’s needs. Offer new opt-ins regularly to get new blood on your list. I know that by now you understand the importance of the opt-in in regards to your business. Henceforth you will serve your audience’s needs, create gold, make your sparkly landing page, and promote like a pro. Go get ’em! Darci Lopez wants to live in a world where her closets are organized, she is on time everywhere she goes, and yoga pants are perfectly acceptable attire. As a mom blogger who writes about simple and practical blogging tips, she’s been honored to be featured on State of Liberation and published on the Huffington Post. When she’s not running around chasing her kids or writing, you can find her plotting her next spectacular opt-in for her readers. She’s currently offering a FREE Create Your Perfect Opt-In Offer Challenge where she dives deep and delivers 10 days of actionable strategies. By the end of the challenge, participants have a brand new and killer opt-in for their audience! You can find her in her free Facebook group, the Brilliant Blogger’s Club, where she talks about everything blogging and then some. Thanks so much for sharing! I’ve been so stuck on how to address the opt in that I’ve been ignoring it. Lol. Thank you for giving me some ideas and actually making it feel realistic. It is totally realistic. I’m so glad you found the post helpful. You got this! This was exactly what I need at the moment. Brian,your article was very helpful. I’ll bookmark this blog for more info. I definitely need an opt-in. This will give me guidance. Thank you! You’re welcome! Don’t be intimidated about creating an opt-in. It’s trial and error. What’s important is that you start! Very informative post for someone like me with zero technical knowledge! Looking into an opt in to grow my email list right now. Awesome things to remember. Thank you! This was interesting, I’ll be sharing it, Thank you! I definitely need one too. I have been considering doing this to my own blog, http://www.realisticme.com, but wasn’t sure when would be the right time! I’m bookmarking now for when I have time to dig into this more. Thanks for sharing! I am in the process of creating my first opt in… Not an easy task but I know… soon important. Thanks for the tips! Ooh, creating your first opt-in is always a challenge. Good luck and do join in on the challenge too! I am just starting out to grow my email list. I am looking for a free landing pages that I can use. I agree with creating Gold. Email lists are my jam! I don’t know of any free landing page plugins that are good. I do recommend Thrive though. Such great info! I’m revisiting my opt in now, trying to make sure to meet these criteria. Thanks for sharing! Working on my email list. Just created my freebie opt in page yesterday. Thanks for sharing! Thanks so much for this information! I’ve just started building my email list a couple of months ago and am doing my best to take care of my subscribers by providing quality content! I am learning all I can!